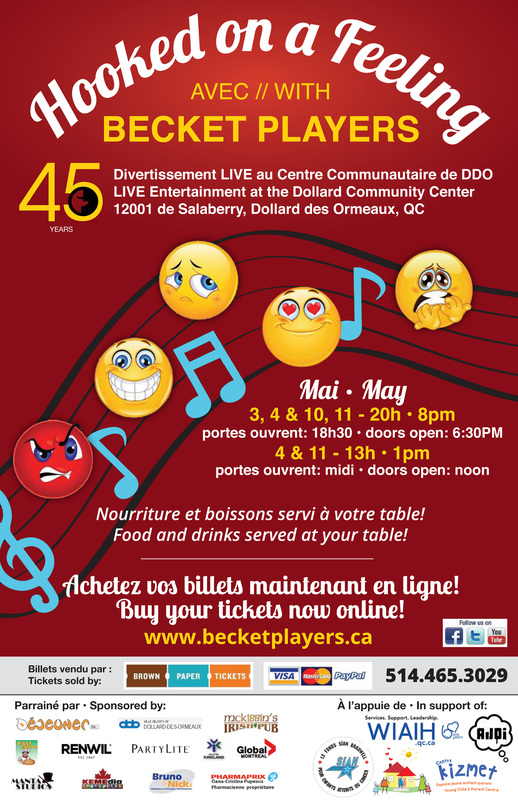 The Becket Players are celebrating their 45th annual production by taking their audience members on a musical emotional roller-coaster ride. Join us at the Dollard Community Center to celebrate our 45th anniversary show! An intimate evening where there is only room for 200 guests per show. At our tables of 8, we provide table-side service where we serve cold beer, wine & Spirits from McKibbin’s Vaudreuil, smoked meat, pizza, and more! Order your tickets NOW! Limited space is available. LIVE entertainment at the Dollard Community Center! May 3,4 & 10, 11 - 8:00PM. Doors open at 6:30PM. Mai 4 & 11 - 1:00PM. Portes ouvrent à midi. food and drinks served at your table! All proceeds from the May 3rd & 10th performances go towards the Sian Bradwell Fund.